Friedrich August von Hayek (May 8, 1899 in Vienna – March 23, 1992 in Freiburg) was an Austrian economist and political philosopher, noted for his defense of liberal democracy and free-market capitalism against socialist and collectivist thought in the mid-twentieth century. Widely regarded as one of the most influential members of the Austrian School of economics, he also made significant contributions in the fields of jurisprudence and cognitive science. His analysis of socialist economics was proven prescient by the breakup of communist Eastern Europe. He shared the 1974 Nobel Memorial Prize in Economics with ideological rival Gunnar Myrdal, and in 1991 he received the Presidential Medal of Freedom. Friedrich August von Hayek was born on May 8, 1899 in Vienna, Austria to a Catholic family of prominent intellectuals. He was a distant cousin of the philosopher Ludwig Wittgenstein. At the University of Vienna he earned doctorates in law and political science in 1921 and 1923 respectively, and also studied psychology and economics with keen interest. He was a student of Friedrich von Wieser. Initially sympathetic to socialism, Hayek's economic thinking was transformed during his student years in Vienna through attending Ludwig von Mises' private seminars along with Fritz Machlup, Oskar Morgenstern, Gottfried Haberler, and other young students. Hayek worked as a research assistant to Jeremiah Jenks of New York University from 1923 to 1924. He then served as director of the newly formed Austrian Institute for Business Cycle Research before joining the faculty of the London School of Economics (LSE) at the behest of Lionel Robbins in 1931. Unwilling to return to Austria after its annexation to Nazi Germany, Hayek became a British citizen in 1938, a status he held for the remainder of his life. In the 1930s Hayek enjoyed a considerable reputation as a leading economic theorist. However, he was challenged by followers of John Maynard Keynes, who argued for more active government intervention in economic affairs. The debate between the two schools of thought has continued, with Hayek's position gaining currency since the late 1970s. 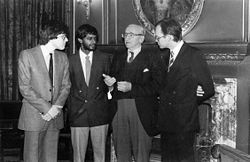 Friedrich A. Hayek with Andrew Melnyk, Chandran Kukathas and Hannes Hólmsteinn Gissurarson in Jesus College, Oxford, in spring of 1985. By 1947, Hayek was an organizer of the Mont Pelerin Society, a group of classical liberals who sought to oppose what they saw as "socialism" in various areas. In 1950, Hayek left the LSE for the University of Chicago, becoming a professor in the Committee on Social Thought. (NOTE: Hayek was barred from entering the Economics department because of his Austrian economic views by one member, whom he would not name but many have speculated was Frank Hyneman Knight). He found himself at Chicago amongst other prominent economists, such as Milton Friedman, but by this time, Hayek had turned his interests towards political philosophy and psychology. From 1962 until his retirement in 1968, he was a professor at the University of Freiburg. In 1974, Hayek shared the Nobel Memorial Prize in Economics, causing a revival of interest in the Austrian school of economics. In his speech at the 1974 Nobel Prize banquet, Hayek, whose work emphasized the fallibility of individual knowledge about economic and social arrangements, expressed his misgivings about promoting the perception of economics as a strict science on par with physics, chemistry, or medicine (the scientific disciplines recognized by the original Nobel Prizes). Margaret Thatcher, the Conservative British prime minister from 1979 to 1990, was an outspoken devotée of Hayek's writings. Shortly after Thatcher became Leader of the party, she "reached into her briefcase and took out a book. It was Friedrich von Hayek's The Constitution of Liberty. Interrupting [the speaker], she held the book up for all to see. "This" she said sternly, "is what we believe" and banged Hayek down on the table. In 1984 he was appointed as a member of the Order of the Companions of Honour by Queen Elizabeth II on the advice of British Prime Minister Margaret Thatcher for his "services to the study of economics." Later he served as a visiting professor at the University of Salzburg. Friedrich Hayek died in 1992 in Freiburg, Germany. Specialists in business cycle theory recognize Hayek's early work on industrial fluctuations, and modern information theorists often acknowledge his work on prices as signals. Hayek's work is also known in political philosophy (Hayek 1960), legal theory (Hayek 1973-1979), and psychology (Hayek 1952). The philosopher of science Karl Popper wrote in letter to Hayek in 1944: "I think I have learnt more from you than from any other living thinker, except perhaps Alfred Tarski." Hayek made a quite fruitful suggestion, made contemporaneously by the psychologist Donald Hebb, that whatever kind of encounter the sensory system has with the world, a corresponding event between a particular cell in the brain and some other cell carrying the information from the outside word must result in reinforcement of the connection between those cells. These days, this is known as a Hebbian synapse, but von Hayek quite independently came upon the idea. I think the essence of his analysis still remains with us. (Edelman 1987, 25). "Hayek posited spontaneous order in the brain arising out of distributed networks of simple units (neurons) exchanging local signals" says Harvard psychologist Steven Pinker: "Hayek was way ahead of his time in pushing this idea. It became popular in cognitive science, beginning in the mid-1980s, under the names 'connectionism' and parallel distributed processing." (Postrel 2004). We want money for many different things, and those things are not always, or even rarely, just to have money for its own sake. … We want money for our spouses or our children or to do something in terms of the transformation of ourselves; for everything from plastic surgery to reading intellectual history or building a church. These are all non-economic goals that we express through the common means of money. (Muller 2002). Consequently, Hayek put the price mechanism on the same level as, for example, language. Such thinking led him to speculate on how the human brain could accommodate this evolved behavior. In The Sensory Order (1952), he proposed the hypothesis that forms the basis of the technology of neural networks and of much of modern neurophysiology. In Prices and Production (1931) and Monetary Theory and the Trade Cycle (1933) Hayek showed how monetary injections, by lowering the rate of interest below what Ludwig von Mises called its "natural rate," distort the economy's inter-temporal structure of production. Most theories of the effects of money on prices and output (then and since) consider only the effects of the total money supply on the price level and aggregate output or investment. Hayek, instead, focused on the way money enters the economy ("injection effects") and how this affects relative prices and investment in particular sectors. In Hayek's framework, investments in some stages of production are "malinvestments" if they do not help to align the structure of production to consumers' inter-temporal preferences. The reduction in interest rates caused by credit expansion directs resources toward capital-intensive processes and early stages of production (whose investment demands are more interest-rate elastic), thus "lengthening" the period of production. If interest rates had fallen because consumers had changed their preferences to favor future over present consumption, then the longer time structure of production would have been an appropriate, coordinating response. A fall in interest rates caused by credit expansion, however, would have been a "false signal," causing changes in the structure of production that do not accord with consumers' inter temporal preferences. The boom generated by the increase in investment is artificial. Eventually, market participants come to realize that there are not enough savings to complete all the new projects; the boom becomes a bust as these malinvestments are discovered and liquidated. Every artificial boom induced by credit expansion, then, is self-reversing. Recovery consists of liquidating the malinvestments induced by the lowering of interest rates below their natural levels, thus restoring the time structure of production so that it accords with consumers' inter-temporal preferences. It is rather a problem of how to secure the best use of resources known to any of the members of society, for ends whose relative importance only those individuals know. Or, to put it briefly, it is a problem of the utilization of knowledge not given to anyone in its totality. (Hayek 1945, 78). "scientific" or technical knowledge—the conscious awareness of the rules governing natural and social phenomena—but of … knowledge, the idiosyncratic, dispersed bits of understanding of "circumstances of time and place" (Hayek 1968). This tacit knowledge is often not consciously known even to those who possess it and can never be communicated to a central authority. The market tends to use this tacit knowledge through a type of discovery procedure (Hayek 1968), by which this information is unknowingly transmitted throughout the economy as an unintended consequence of individuals' pursuing their own ends. Indeed, Hayek's (1948) distinction between the neoclassical notion of "competition," identified as a set of equilibrium conditions (number of market participants, characteristics of the product, and so on), and the older notion of competition as a rivalrous process, has been widely influential in Austrian economics. On the other side, the key to a functioning economy—or society—is decentralized competition. In a market economy, prices act as a "system of telecommunications," coordinating information far beyond the scope of a single mind. They permit ever-evolving order to emerge from dispersed knowledge. In any complex operation, there is too much relevant information for a single person or small group to absorb and act on. For Hayek, market competition generates a particular kind of order—an order that is the product "of human action but not human design" (a phrase Hayek borrowed from Adam Smith's mentor Adam Ferguson). This "spontaneous order" is a system that comes about through the independent actions of many individuals, and produces overall benefits unintended and mostly unforeseen by those whose actions bring it about. To distinguish between this kind of order and that of a deliberate, planned system, Hayek (1968b, 72-76) used the Greek terms cosmos for a spontaneous order and taxis for a consciously planned one. Most importantly, however, Hayek always stressed that his moral philosophy has to be backed by “a complex system of moral codes, rules of fairness, as well as an articulated system of punishment for the violators … a system under which a bad man can do the least harm.” (Hayek 1945). Hayek noted that the market does not always work perfectly. People's plans are not always successfully coordinated, resulting in high unemployment, for example. For Hayek, it was government intervention that served as cause not solution to many market problems. Thus, he argued that increases in the money supply by the central bank led to artificially reduced interest rates which gave false signals to investors, resulting in malinvestments (Hayek 1931). Such an artificial boom necessarily leads to artificial bust as the market spontaneously finds its natural order again. Hayek argued that the way to avoid the busts was therefore to avoid the artificial booms. As one of Keynes' leading professional adversaries, Hayek was well situated to provide a full refutation of Keynes' General Theory. But he never did. Part of the explanation for this no doubt lies with Keynes's personal charm and legendary rhetorical skill, along with Hayek's general reluctance to engage in direct confrontation with his colleagues. Hayek also considered Keynes an ally in the fight against wartime inflation and did not want to detract from that issue (Hayek, 1994, 91). Caldwell (1988) suggests another reason: it was during this time that Hayek was losing faith in equilibrium theory and moving toward a "market process" view of economic activity, making it difficult for him to engage Keynes on the same terms in which they had debated earlier. Furthermore, as Hayek later explained, Keynes was constantly changing his theoretical framework, and Hayek saw no point in working out a detailed critique of the General Theory, if Keynes might change his mind again (Hayek, 1963, 60; Hayek, 1966, 240-241). Hayek thought a better course would be to produce a fuller elaboration of Eugen von Böhm-Bawerk's capital theory, and he began to devote his energies to this project. The following quote puts Hayek’s “side” into a proper perspective. was to make clear how our present complex social structure is not the result of the intended actions of individuals but of the unintended consequences of individual interactions over a long period of time, the product of social evolution, not of deliberate planning. (Postrel 2004). Hayek's major insight, which he referred to as his "one discovery" in the social sciences, was to define the central economic and social problem as one of organizing dispersed knowledge. Different people have different purposes. They know different things about the world. Much important information is local and transitory, known only to the man on the spot. "Some of that knowledge is objective and quantifiable, but much is tacit and unarticulated. Often we only discover what we truly want as we actually make trade-offs between competing goods … The economic problem of society," Hayek wrote in his 1945 article, "is thus not merely a problem of how to allocate `given' resources … if `given' is taken to mean given to a single mind which deliberately solves the problem set by these data. … It is rather a problem of how to secure the best use of resources known to any of the members of society, for ends whose relative importance only these individuals know … Or, to put it briefly, it is a problem of the utilization of knowledge which is not given to anyone in totality." (Hayek 1945). Applying this insight to socialist thought, revealed that central economic planning was doomed to failure. Hayek was one of the leading academic critics of collectivism in the twentieth century. He believed that all forms of collectivism (even those theoretically based on voluntary cooperation) could only be maintained by a central authority of some kind. In his popular book, The Road to Serfdom (1944) and in subsequent works, Hayek claimed that socialism required central economic planning and that such planning in turn had a risk of leading towards totalitarianism, because the central authority would have to be endowed with powers that would impact social life as well. In Hayek's view, the central role of the state should be to maintain the rule of law, with as little arbitrary intervention as possible. It was shocking enough for Britain, where his views were respectfully, though critically, received. But in the United States, where Reader's Digest published a condensed version, The Road to Serfdom was a bestseller and a political lightning rod. It rallied supporters of traditional free enterprise and enraged the intelligentsia to whom it was addressed. How dare this mustachioed Austrian suggest that the ambitions of the New Deal might have anything in common with Hitler or Stalin! (Postrel 2004). Hayek went eventually as far as to attribute the birth of civilization to private property in his book The Fatal Conceit (1988). According to him, price signals are the only possible way to let each economic decision maker communicate tacit knowledge or dispersed knowledge to each other, in order to solve the economic calculation problem. 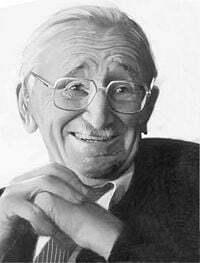 When we combine Hayek’s key theorems, it emerges that economic development requires (a) the “learning process” of how to play the social roles of which market relations is based on and keeping within the implicit rules and (b) the moral codes of co-operative society (which punishes violators), to form a system marginalizing the opportunities and other elements harmful to the society while forming the ultimate criterion of success. Such a “learning process” - in which the moral codes are spontaneously achieved - is, however, a function of time usually measured in terms of generations (Dallago 1996, 82, 116-117). The time-element of this “learning process” is obviously non-existent (at least not spanning generations) in developing and transitional societies. Instead, we see quick "privatizations" (often by the old oligarchy who had the money to buy the bulk of industrial infrastructure) and “quasi-market” relations without sufficient moral scruples, codes of conduct, or functioning legal system. Attempts to substitute the generations-long “learning process”—of how to achieve at least minimum functioning legal, moral, and co-operative notion in the society—in these new “free market” societies have been based on exogenous inputs. Whether involving the transfer of a whole constitution (or major substantive and civil laws) or just amendments to the existing dysfunctional system, the results have unfortunately, in many cases been unsuccessful, as Hayek's insights predicted. Thus, Hayek’s theorem of generations-long learning process on the road to full-fledged democracy proved to be one of his most prophetic. When the definitive history of economic analysis during the 1930s comes to be written … a leading character in the drama (it was quite a drama) will be Professor Hayek. … It is hardly remembered that there was a time when the new theories of Hayek were the principal rival of the new theories of Keynes. (Hicks 1967, 203). He had a wide-reaching influence on contemporary economics, politics, philosophy, sociology, psychology, and anthropology. For example, Hayek's discussion in The Road to Serfdom (1944) about truth and falsehood in totalitarian systems influenced later opponents of postmodernism (Wolin 2004). Having heavily influenced Margaret Thatcher's economic approach, and some of Ronald Reagan's economic advisors, in the 1990s Hayek became one of the most-respected economists in Europe. There is a general consensus that his analyses of socialist as well as non-socialist societies were proven prescient by the breakup of communist Eastern Europe. After his death, Hayek's intellectual presence continued to be noticeable, especially in the universities where he had taught: the London School of Economics, the University of Chicago, and the University of Freiburg. A student-run group at the LSE Hayek Society, was established in his honor. At Oxford University, there is also a Hayek Society. The Cato Institute, one of Washington, DC's leading think tanks, named its lower level auditorium after Hayek, who had been a Distinguished Senior Fellow at Cato during his later years. Also, the auditorium of the school of economics in Universidad Francisco Marroquín in Guatemala is named after him. Hayek, F. A. 1935. Prices and Production. London: Routledge & Sons, Second revised edition: London: Routledge & Kegan Paul. Hayek, F. A. 1991. "The Trend of Economic Thinking." Economica (13), 121-137. Reprinted in Hayek, 1948, 17-34. Hayek, F. A. 1937. "Economics and Knowledge." Economica N.S. 4. 33-54. Reprinted in Hayek, 1948, 33-56. Hayek, F. A. 1939. "Price Expectations, Monetary Disturbances, and Malinvestments." In Hayek, Profits, Interest, and Investment. London: Routledge and Kegan Paul. 135-156. Hayek, F.A. 1949. "Individualism, True and False." Individualism and Economic Order. London: Routledge & Kegan Paul, 10-11. Hayek, F. A. 1948. "The Use of Knowledge in Society." American Economic Review 35 (September): 519-530. 77-91. Hayek, F. A. 1948. "The Meaning of Competition." In Hayek. 92-106. Hayek, F. A. 1952. The Sensory Order. Chicago: University of Chicago Press. Hayek, F. A. [1968a] 1978. "Competition as a Discovery Procedure." In Hayek 179-190. Hayek, F. A. [1968b] 1978. "The Confusion of Language in Political Thought." In Hayek 71-97. Hayek, F. A. 1973. Law, Legislation, and Liberty. Three volumes. Chicago: University of Chicago Press, 1973-1979. Hayek, F. A. 1978. New Studies in Philosophy, Politics and Economics. Chicago: University of Chicago Press. Hayek, F. A. 1989. The Fatal Conceit: The Errors of Socialism. Ed. by W. W. Bartley III. vol. 1 of The Collected Works of F. A. Hayek. London: Routledge and Chicago: University of Chicago Press. Hayek, F. A. 1991. The Trend of Economic Thinking: Essays on Political Economists and Economic History. Ed. W. W. Bartley III and Stephen Kresge. Chicago: University of Chicago Press, and London: Routledge. Hayek, F. A. 1992. The Fortunes of Liberalism, Edited by Peter G. Klein. Vol. 4 of The Collected Works of F. A. Hayek. Chicago: University of Chicago Press, and London: Routledge. Hayek, F. A. 1995. Contra Keynes and Cambridge: Essays, Correspondence. Ed. Bruce Caldwell. Vol. 9 of The Collected Works of F. A. Hayek. Chicago: University of Chicago Press and London: Routledge. Hayek, F. A. 1966. "Personal Recollections of Keynes and the 'Keynesian Revolution.'" In Hayek. 240-246. Hayek, F. A. 1963. "The Economics of the 1930s as Seen from London." Hayek. 49-73. Birner, Jack, 2001. "The mind-body problem and social evolution." CEEL Working Paper 1-02. In Politics, economics and the history of ideas. Caldwell, Bruce. J. 1998. "Hayek's Transformation" In History of Political Economy. 513-541. __________. 1997. "Hayek and Socialism." In Journal of Economic Literature no. 4. (1856-90). __________. 2005. Hayek's Challenge: An Intellectual Biography of F. A. Hayek. Dallago, B. & L. Mintone. 1996 Economic Institutions, Markets and Competition. Edward Elgar. Edelman, G. 1987. Neural Darwinism, 25. Epstein, R. Simple Rules for a Complex World. Cambridge, MA: Harvard Univ. Press. Hicks, Sir John. 1967 Critical Essays in Monetary Theory. Oxford, Clarendon Press. Muller, Jerry Z. 2002. The Mind and the Market: Capitalism in Western Thought. Anchor Books. Postrel, Virginia. 2004. “Friedrich the Great” The Boston Globe January 11, 2004. Retrieved February 9, 2007. Wolin, R. 2004. The Seduction of Unreason: The Intellectual Romance with Fascism from Nietzsche to Postmodernism. Princeton University Press. Yergin , D. & J. Stanislaw. 1998. The Commanding Heights: The Battle Between Government and the Marketplace that Is Remaking the Modern World. New York: Simon & Schuster, 14-15. The Presumption of Reason, draft paper prepared in 1985. This page was last modified on 12 May 2017, at 22:13.